Whew, it’s been a hot minute since I did a High Five for Friday roundup! If you were in the Midwest this week, I think we all deserve some kind of medal for dealing with this weather. Highs and wind chills in the negative digits? This weather officially blows (both literally and figuratively). Spring, please hurry. I’m off to Schaumburg today for the weekend to spend some much-needed time with my mom, hit up Ikea for some goodies for the home, and attend a family baby shower. I know Finley is pretty excited to see his second set of parents, too. Whatever your plans for the weekend, I hope you have a good one! Here’s a quick recap of my week. 1. I’m working hard to make 2015 the year of the blog – from revamping some of my content and improving my photography skills, I’m officially in makeover mode. That all starts with branding and Web design. I’ve hired Bethany from Love Grows Design, and I could not be more excited to work with her. Stay tuned! 2. 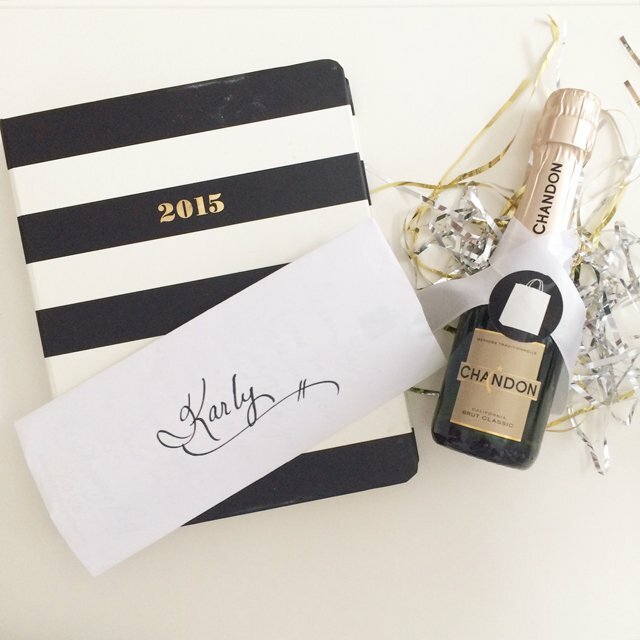 Speaking of starting 2015 off right, what better way to do so than to receive a handwritten note, a piece of jewelry, and a mini-bottle of champagne in the mail? The Shopping Bag nailed this one. (I collaborated with them back in November 2014 – check out the post). 3. Have any of you been to Target lately? Their clearance and markdowns are insane on clothing, shoes and accessories. This is just a snapshot of a few things I’ve picked up recently – I’m loving the quilted slip-on sneakers and black boots. 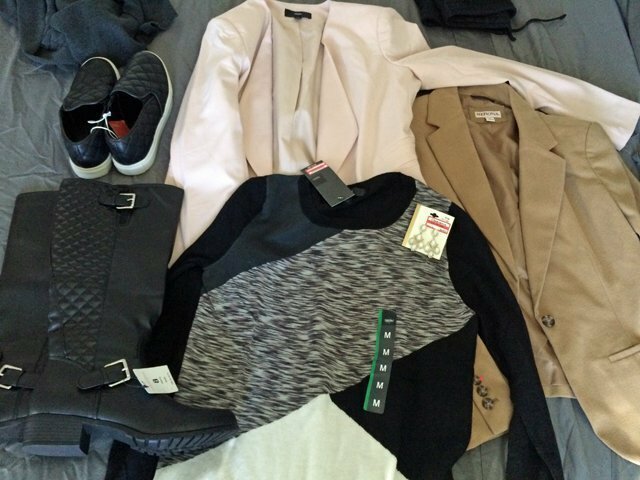 Not pictured is a cream faux-fur sweater vest and the cutest Kate Spade look-a-like evening bag. 4. 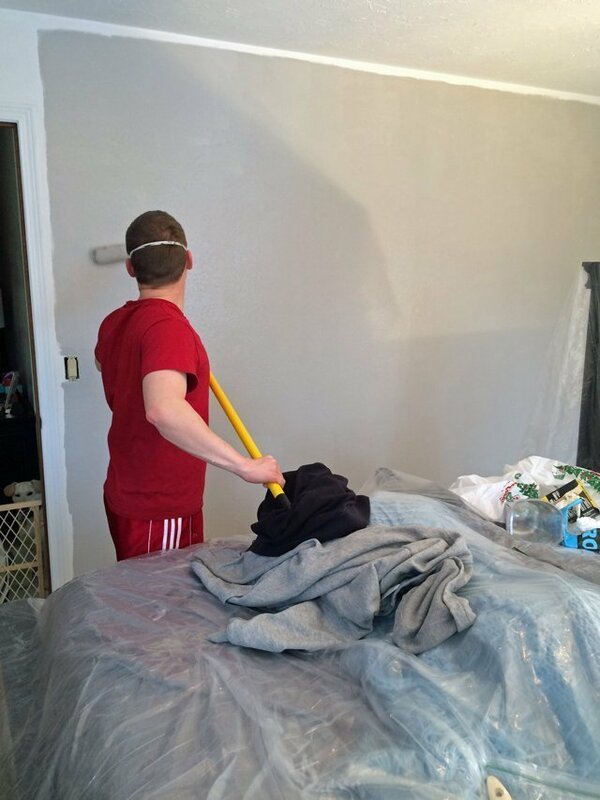 As I alluded to in Monday’s post, last weekend was quite the busy one for Ryan and I as we decided to makeover our whole bedroom in one weekend, at least paint wise. I’m waiting to do a full-reveal until every last detail is finished, but here’s a quick sneak peak from when we started to paint. The color is Knitting Needles from Sherwin Williams. Glad to hear you'll be joining us! It's actually how I came across your blog, along with several others that I love, and I hope that others have the same experience with the link-up! Me too! So nice to have you home! Yay, you got the camel blazer! And I'm in love with that other (blush maybe?) blazer – so cute! 2015 is the year of the blog for me, too… at least I'm trying haha – can't wait to see how your new design turns out 🙂 Hope you had fun at home this weekend! This comment made my day and brought the biggest smile to my face – you are the cutest! Please come over so we can get ready and rock out to our 90's tunes, total high school style. I think it'd be pretty epic. Hope you had a wonderful weekend, happy Sunday! Yeah!! I can't wait to see what you do to your blog. I've considered WordPress, too, but I just don't think I'm ready to make the leap yet. Maybe in the future! It's 30 degrees out today, and it actually feels warm! That's pretty sad, lol. Hope you had a great weekend! I went through a makeup brush obsession back in college, so that's the only reason I've accumulated so many. I probably should go through my collection and clean some out! Right?! It almost seems ridiculous that all the winter clothes are on clearance and the bathing suits are out. I can't believe my little Finny is already 8 months old! Time flies. Thanks for letting me know about the H54F linkup – since I was traveling/out of town this weekend, I got behind on actually submitting my links to all the linkup parties, so I'll definitely be participating next week! Thanks, girl! Ikea was wonderful, as always. 🙂 Hope you had a good weekend! Thank you so much! I'm hoping to have it finished in the next couple weeks so I can share it with all of you. Finn really is something else – he just always need to know what I'm doing! You definitely need to make a Target trip – I think you'd find some goodies! Schaumburg was good – busy as always! Hope you had a good weekend! I had such a great weekend with you, mom! Oh no! That's the worst when that happens. I'm glad I'm not the only one who did some damage at Target – it's kind of hard to resist right now! Hope you had a great weekend! Yes, Target is killing it right now! Hope you had a good weekend! Ahh I'm so excited to see what you do with your bedroom, that colour looks beautiful!! I'm planning on doing a blog overhaul this year too – I'm seriously considering switching to WordPress so I can take advantage of all the plugins and other things it has to offer! That is cute stuff from Target! I love that they are discounting winter clothes lately! I still need some because we have at least 3 more month of winter here! I'm a little jealous of your Target clearance haul! You got some amazing stuff. I especially love those boots and that sweater! And Finn is growing up quickly! Also, I hope you'll hop over to my blog and link up for H54F:) Some of my friends and I are carrying on the H54F torch for the Lauren Elizabeth and would love to have you link up! Since it's our 1st week, we're doing a giveaway for a $100 Target giftcard to 1 of the bloggers who links up with us! Hope you'll join in! Aw you and Finn, too cute! What a sweet little gift from The Shopping Bag, love that. Have a good weekend,enjoy IKEA! Your room is already looking fantastic! I can't wait to see the finished product. Okay, I'm loving how your sweet puppy likes to sit with you at your vanity. He looks like he's trying to figure out what you're doing. Too adorable! Love that paint color, can't wait to see more! Those are some great Target finds, I'm going to need to make a trip. Enjoy your time in the burg this weekend! I am so looking forward to our weekend together! Love the picture of you and Finn, he is something else! Happy Friday! The Chicago weather was BRUTAL this week. I agree that we all deserve a medal, or at least a huge bottle of wine. I did some damage last weekend at Target with all their stuff on clearance! Looks like you got a good haul. Finn is so cute sitting with you! Can't wait to see the finished bedroom and new blog look. Happy weekend girl!! Sounds like I need to make a trip to Target soon! 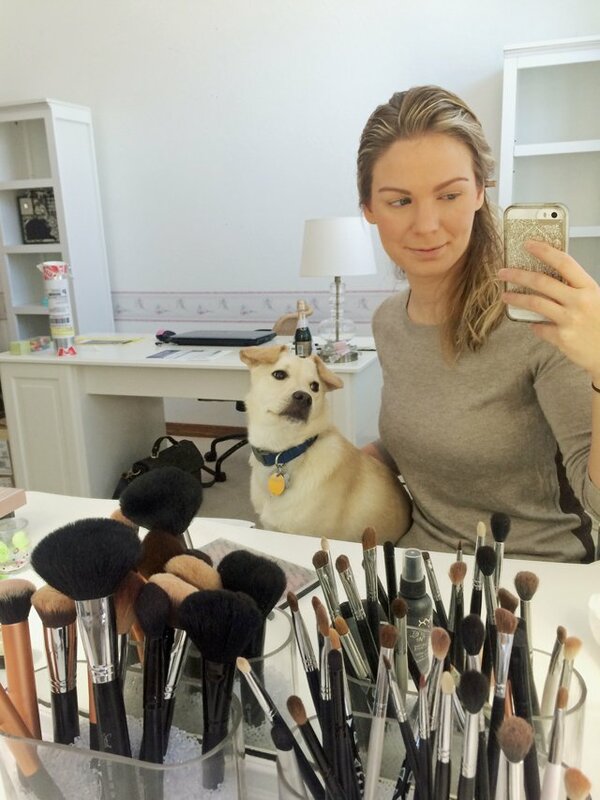 And love that Finn sits with you while you do you're makeup. He is too cute! Happy Friday!